1The smartwatch seems to be catching on, at least among early adopters working in the tech industry. At the Samsung Developer Conference here, many of the 1,300 independent developers were wearing smartwatch devices on their wrists, though not all were the $300 Galaxy Gear version Samsung launched recently to pair with Galaxy devices like the Note 3. Several developers said they have realized how a smartwatch really can simplify their lives when using a smartphone. For instance, they don't have to fish through a pocket, backpack or purse to quickly check an email or text notification on a smartphone, or in some cases take a call. Many of the Samsung executives at the developer event sported new Gear watches with white wristband, including Curtis Sasaki, vice president of Samsung's Media Solution Center in the U.S. He presented the opening keynote. After, Sasaki used his Gear smartwatch to take an up-close photo of a Computerworld reporter during an interview and conducted a phone call through the watch to the reporter to demonstrate the audio capabilities on the call. "Having the ability to make phone calls on the watch completely changes my behavior," he said, noting that he no longer needs to grab his large Galaxy Note 3 smartphone to answer or make a call. People he calls are often surprised at the sound quality. Asked whether the $300 price tag is too high for a Galaxy Gear smartwatch, Sasaki was non-commital: "I don't know about that. We're at the infancy of this category and Samsung will continue to innovate.... Wearables are a totally new product segment and we focused initially on our watch. We had a lot to do to make it work and make it a great user experience with a core set of apps." One app that works with the Gear smartphone is an eBay notification feature that can be used to send an alert to the watch when an online eBay bidder is out-bid. Many eBay bidders want such alerts so they can make a quick response. During the keynote, Gregory Lee, president of the U.S. mobile business for Samsung, said that working with eBay on the Galaxy Gear eBay app was just one example of Samsung's ability "to extend our mobile real estate." Some analysts don't seen smartwatches and other wearables such as Google Glass catching on with more than a small audience. Carolina Milanesi, an analyst at Gartner, recently said wearables will remain a "nice to have, rather than a must-have" through 2017, with smartphones, and perhaps tablets, remaining the most faithful companion to consumers. But don't tell that to Samsung developers who arrived at the first ever Samsung Developer Conference to learn how they can profit by creating Android apps specifically for Samsung devices, including the Gear. 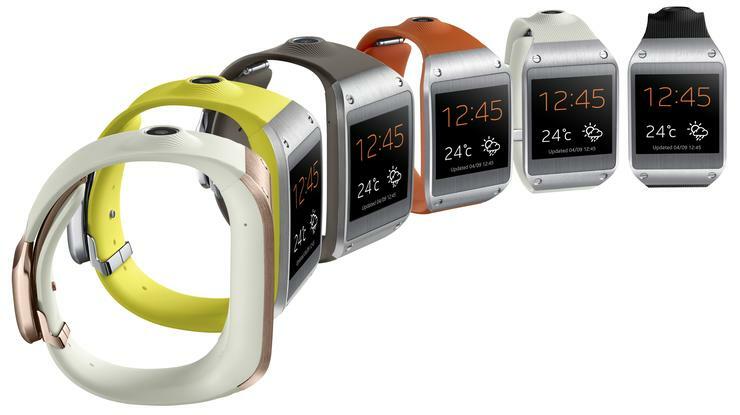 Some analysts believe Samsung created the Galaxy Gear to showcase its ability to produce a steady stream of new devices. There are several Galaxy tablets now on the market with screen sizes from 7 inches to 10.1 inches, a line of Galaxy Note smartphones and a Galaxy S smartphone line that now includes the new Galaxy S4. Samsung can produce multiple devices so fast because of its size, global marketing reach and ability to build its own components, including processors. Officials at Rabbit, a video chat provider that works with Samsung mobile products, noted that the Galaxy Gear smartwatch has a camera and that Samsung has just announced a multi-display Software Developers Kit (SDK) that allows video streaming from a small mobile device to a smart TV and other hardware platforms. "Samsung is re-engineering its hardware for multiple displays," said Rabbit founder and president Nicholas Reichenbach in an interview. "Samsung is cranking out crazy amounts of hardware and has lots of distribution partners. They are using their scope in manufacturing to pop out six variances of a device and see which ones do better." A Rabbit video chat app for the Galaxy Gear smartwatch is inevitable, he said, without offering any timeline. "The next logical step for our partnership with Samsung would include support [for] all their devices," he said. "Video chatting on a Galaxy Gear smartwatch is so StarTrek that we need to 'make it so.'" Even if the Galaxy Gear smartwatch or another device doesn't do well in the market in the short term, Samsung is likely to stick with the concept, partly just because it can. If Apple were to offer an iWatch, and it didn't sell well, investors and other people would quickly take note, Reichenbach said. "If a product from Samsung doesn't do well, they have so many products that people wouldn't even know about it," he said. Sasaka smiled when it was suggested in an interview that Samsung has a "scorched-Earth policy" for making a multitude of mobile products to sell and essentially covering the globe in a given year. "Earth is a big planet and different geographies need different price points and have different needs" in mobile products, Sasaka said. "Fortunately, Samsung is big enough to do it this way."